With the release of Black 47, a movie about the ‘Great Potato Famine’ of Ireland in the 19th century out in the next week, we take a timely but controversial look at how the famine wasn’t a famine at all and the British government stood idly by and let millions of Irish die in what is now being called genocide. A blight upon the potatoes of Ireland forever changed the histories of Ireland, England, and the United States of America. The blight that we now know was a water mold (and not a fungus as originally believed), Phytophthora infestans, attacked the cash crop of the Irish Catholic peasant farmer. This was the crop with which the Irish paid their rent to the English and Protestant landlords. Starving Irish peasants tried to eat the rotten potatoes and fell ill to cholera and typhus and whole villages were struck down. Many landlords evicted the starving tenants who could be found dying on sides of roads with mouths green from eating grass to fill their bellies. Other families were sent to workhouses where the overcrowding and poor conditions led to more starvation, sickness, and ultimately death. Going to a workhouse was akin to marching to one’s own death. Some more sympathetic landlords paid the passage for their tenants to emigrate to America, Canada, and Australia. Ship owners took advantage of the situation and wedged hundreds of diseased and desperate Irish into ships that were hardly sea-worthy for the Trans-Atlantic trip. These ships became known as “coffin ships” as more than one-third of the passengers died on the voyage. “The Almighty indeed sent the potato blight, but the English created the Famine”. From the Greek word for tribe (or race), genos, and the Latin term -cide, the word genocide refers to the extermination of the peoples of a nation (or religious group) carried out by an organization, usually a government. Such is the case when discussing the British treatment of Ireland during the potato blight; treatment which was based in the history of Ireland. The Penal Laws, first passed in 1695. were strictly enforced. These laws made it illegal for Catholics (Irish) to own land, and required the transfer of property from Catholics to Protestants; to have access to an education, and eliminated Gaelic as a language while preventing the development of an educated class; to enter professions, forcing the Irish to remain as sharecropping farmers; or to practice their religion. In addition, Catholics (Irish) could not vote, hold an office, purchase land, join the army, or engage in commerce. Simply put, the British turned the Irish into nothing better than slaves, subsisting on their small rented farms. The exportation of wheat, oats, barley, and rye did nothing to help the financial status of the poor farmer. The produce was used to pay taxes and rents to the English landlords, who then sold the farm products for great profit. These profits did nothing for the economy of Ireland, but did help the English landlords to prosper. The Irish farmer was forced to remain in poverty, and reliant on one crop, potato, for his subsistence. The potato became the dominant crop for the poor of Ireland as it was able to provide the greatest amount of food for the least acreage. Farming required a large family to tend the crops and the population grew as a result of need. Poverty forced the Irish to rely upon the potato and the potato kept the Irish impoverished. It is time for the world to stop referring to this disastrous period in Irish history as the Great Famine, and to fully realize, and to acknowledge, the magnitude of the crime that systematically destroyed Irish nationalism, the Irish economy, the Irish culture, and the Irish people. On Sunday 14th May 2017, it will be 170 years since the beginning of An Gorta Mor (The Great Hunger) in Ireland. This year there will be a memorial event outside TUC Congress House. This location has been chosen because the Parish of St. Giles was the first recorded ‘Little Ireland’ in London. Many Irish people who lived in this parish endured overcrowding, poverty and squalor and many died of typhus. 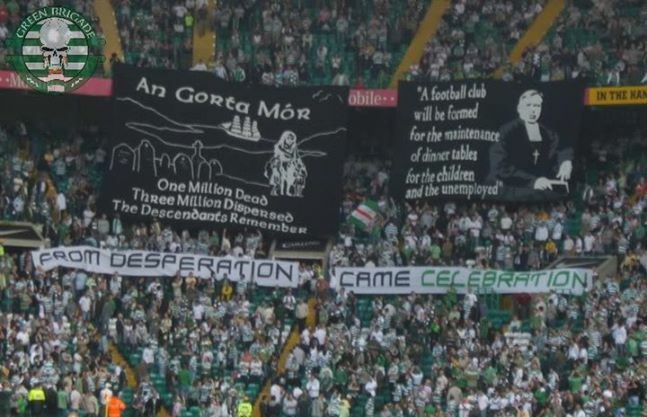 For this reason, a number of us will be campaigning for a memorial statue to ‘An Gorta Mor’ in this part of London. Unlike Liverpool, no other such statue exists in the capital city. We like to seen the statue dedicated to all the Irish and other migrant workers who made Britain, the most industrialised nation in the world through their concentration of cheap labour! The event will last for about 40 minutes. Invited speakers are as follows: Austin Harney will speak on the callous administration of Lord Trevelyan who was Head of the Treasury in 1847. This administration under its prime minister, Lord John Russell, denied the vital imports of grain supplies to Ireland, thus causing many Irish people to die of starvation. Niall Mulholland will speak on how An Gorta Mor devastated the people of the North of Ireland and Mick Gilgunn will speak on how the poverty stricken Irish immigrants in London built the British Trade Union movement and the prosperity of the capital of Britain since the days of An Gorta Mor! After the speakers, we will have a minute’s silence for all the Irish people who died and forced to flee from Ireland as a result of this “Great Hunger”. When I was a kid I grew up taught that the Irish famine was a natural catastrophe caused by crop failure. That I was taught this at a school in England where I’d guess well over 50 % of the children had Irish parents or Grandparents is quite simply wrong. The books I was given in History class of course didn’t tally with the accounts I was hearing at home and as has been the way with the Irish abroad it was that passed on history that won the day. While it is true that the main crop for the Irish and especially the working class Irish was the potatoes the truth as ever is far more startling. In the best book ever written on the subject, The Great Hunger, British Historian Cecil-Woodham Smith exposed the removal of food to Britain and became a pariah in academia for the next 30 years. Historians and their books maintain the lie that only potato’s were cultivated and anyone bringing the genocide out in the open is smeared as a “republican sympathiser”. but again did not acknowledge role of the British Army in forced food confiscations. “will not kill more than one million Irish in 1848 and that will scarcely be enough to do much good”. During the “famine” years, Irish foodstuff received high prices on the agricultural and commodity markets of the world. The British Empire covered half the globe; why else would it keep half its armies in Ireland at great expense? The Irish were an obstacle to Britain’s world power. They were Celtic, Catholic with their own rich culture and traditions, namely strong: National identity, Family, Culture and faith. The Irish have a strong Celtic consciousness giving the people the ability to think critically, morally and be self-sufficient. It’s in our DNA no one can ever extinguish it. On Sunday 22nd May there will be a memorial event in London to the Irish Famine which many refer to as a genocide! It will take place outside the main entrance of Congress House in Great Russell Street. Speakers invited will be on behalf of the Parvees (Irish Travellers) who owe their roots to this atrocity as many were evicted from their homes in Ireland and the London 1916 Easter Rising Centenary Committee since the Famine fuelled nationalism in Ireland which led to the Rising in 1916, itself. This event is to remember the many Irish people who died in An Gorta Mor and the many who fled to London. It will be over 170 years since An Gorta Mor began to inflict many deaths in Ireland and we have chosen this spot as it is part of the Parish of St. Giles known as ‘Little Ireland’ throughout the 19th century. This area was home to many Irish migrant labourers who lived in overcrowded levels of poverty and squalor. During these times huge numbers of Irish people died due to lack of nutrition and sanitation! The London Memorial to the Irish Famine is hosted by the South East Regional TUC Race Relations Committee who document the history of migrant workers to Britain. Irish workers were instrumental in building the trade union movement and through their mass concentration of cheap labour, their production made Britain the most industrialised nation in the world! It is important that we remember all these Irish people in London as well as the millions who died in Ireland and abroad as well as those forced to leave to survive. May they rest in peace! The potato is a tuberous vegetable that is native to the Andes of South America. Following the Spanish exploration and exploitation of the South American Indians, the potato was introduced to Europe where it had a profound effect on the diets of Europeans from Ireland well into Russia. It grew well all over Western Europe and Eurasia. A population explosion followed and continued well into the 19th century. The potato grew prolifically in Ireland and was a product grown on every Irish farm. With few exceptions, however, the Irish farmers were tenant farmers and had no rights on the land they farmed. If they grew wheat, barley oats, or raised cattle on their land, that produce was taken by the absentee landlords, most of whom lived in England and placed on English ships for export. The British Empire was maintained by so-called English beef, English wheat and barley, and English pork, all of which was produced in Ireland. Conventional wisdom has it that the Irish were too stupid to grow anything but the potato, and were barred from planting anything else. Their nutritional status was high because potato skins could be fed to hogs, one or two of which could be kept by a household, as well as chickens. If a farmer was fortunate enough to have a milk cow, their diet, based on the potato was highly nutritious. However, potatoes have predators. One of them is a fungus, the potato blight, which will destroy the entire potato plant from above ground leaves to tubers below the ground. At some point in the mid-1840s, one ship sailing from South America introduced potato fungal spores into Ireland. The result was absolutely catastrophic, with every Irish farm infected with the blight by 1846. With their primary food source cut off, the Irish began starving by the millions. Exports of Irish produce (‘English beef’) continued unabated throughout the (‘so-called famine’) Án Gorta Mór. All over Ireland, the odours of dead potatoes and starving, dead people permeated the countryside. The potato blight did not just affect Ireland, but extended its reach all across Europe. Potato crops failed in France, Germany, Poland, and Russia but those countries stopped exporting food so they could feed their own people. No such thing happened in Ireland. It took months during 1846 for the news of the terrible condition of the Irish people to reach the United States and other countries. In the states, the Quakers and wealthy Jews from New York collected money and shipped vast numbers of food to the starving Irish. The ships were stopped when they entered Irish ports and were required to be offloaded into English ships, which ended up distributing the food to horses owned by the British Army. English authorities claim the population of Ireland was 8 million at the time of Án Gorta Mór. A number of Irish writers have claimed that the population of Ireland was 11 million. If that was the case, over 5 million people in Ireland starved to death, cutting their population almost in half. Regardless of what figures you use, the 1846–1847 census ranks as one of the greatest hunger crisis in human history. Nothing today even compares to it. With few exceptions, the response of English society was one of denial and ridicule. Most people in England viewed it as a superb opportunity to cleanse Ireland of their poor, ignorant tenant farmers. Absentee landlords stepped forward with offer to pay passage to any starving Irish who were willing to emigrate. The ordeal aboard the ships that carried them to the United States were horrendous. The passengers were emaciated, filthy, near death and lice-ridden. Many ships were lost at sea, and the mortality rate aboard the ships reached 20% of all Irish emigrants. Deaths were so common on board that the dead were thrown overboard without so much as a word of prayer or comfort said over them. When they arrived the exploitation continued as soon as these poor souls stepped off the ships and the misery of those Irish continued many years after they had left Ireland. Eventually the Irish would go on to dominate politics in the United States while here they became the backbone of the growing trade union movement. If you are unable to join us on the 22nd May then we ask you to pause for one minute and spare a thought or a prayer for not just those poor souls lost at home but also those that famine spread out across the globe. for an excellent resource on the history of Ireland we recommend you go to the absolutely fantastic web site of Stair na hÉireann (here) a labour of love of Ireland, sharing the history, traditions, folklore, mythology and photography. another interesting event is on the following week on Sunday 29th May with a Historical 1916 Walk in north London so exercise your mind, body and spirit whilst learning about Irish History and Culture. Join members of the London 1916 Centenary Committee on a guided walk through the streets of Islington, North London. The walk highlights places of interest where links are made to cultural, social and political involvement. These include the German Gym, Clerkenwell Prison, Suffragette links and IRB places of interest. The walk ends at Pentonville prison where Roger Casement was executed. The walk is approximately two hours long. Meet outside the German Gym at Kings Cross at 2pm sharp. The German Gymnasium is located directly opposite the domestic entrance to St Pancras International Station. Event page here. 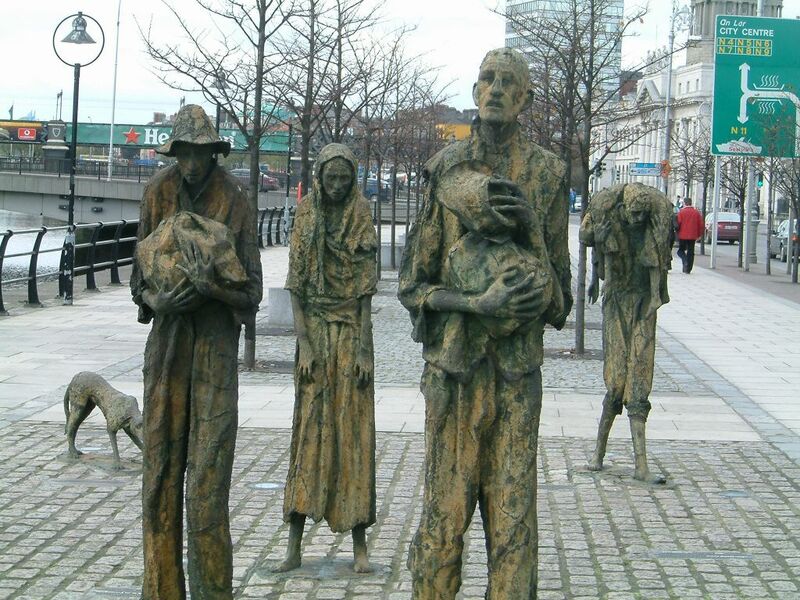 Today Sunday 10th May is National Famine Memorial Day. Pause for one minute on Commemoration Day, May 10, and spare a thought or a prayer for not just those poor souls lost at home but also those spread out across the globe. After only a mere 160 or so years on the Irish government finally commemorates that half of the country died of hunger or were forced to leave their homeland due to a deliberate policy of forced starvation. They’ve decided to call this commemoration of the dead a ‘Famine’ memorial day. The commemoration is long overdue. But it’s not a famine we should be commemorating. 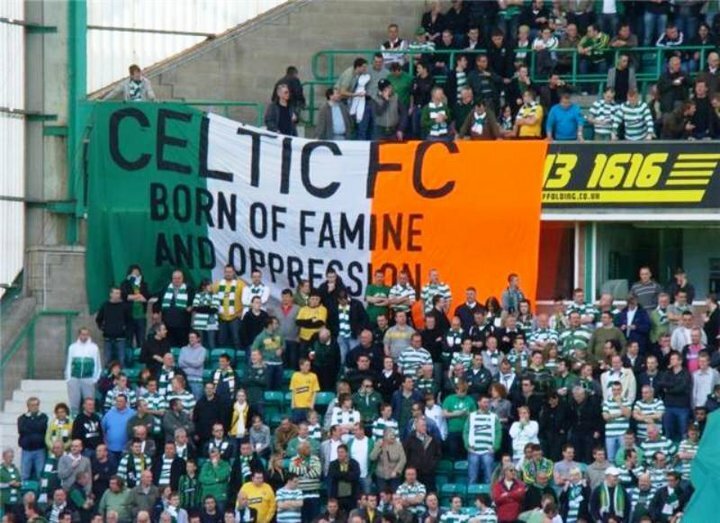 Because there was no famine. A famine is when there is not sufficient food to feed the population. What happened in Ireland in the 1840s was attempted genocide. Let’s look at the evidence, and I don’t mean the mounds of dead, some containing the remains of over 10,000 people, that dot our landscape. Nor do I mean the ghost towns of the West of Ireland. I mean the documentary evidence of genocide. What is a genocide? In common terms, it is the attempt to murder an entire race of people. But the United Nations has a legal definition. In fact, it has an entire convention on genocide. The relevant part is section 2, which defines acts of genocide. But some people object to the suggestion that there was intent on the part of the British government of the time. They suggest that the famine was an act of God, of nature, a tragic accident caused by a fungus on a tuber which had nothing to do with any human action or intent. To demonstrate the intent of the British colonial administration of the time, it is important to look at their own stated documents on the matter. In other words, a policy of clearing Ireland of its ‘surplus’ of people and driving many of them to America would be of benefit to the American economy and to the easier administration of Ireland by Britain! Bear in mind this was written at the height of the horror – Black 47. This isn’t some sort of ‘Modest Proposal’ type of joke. This is a genuine policy proposal. In other words, the newspaper of record in England records with glee the imminent demise of the Irish as a nation in the hope that its land can be cleared for plantation by Britons. But again, perhaps it is unfair to attribute these mainstream British opinions to the government itself? Let’s look at what they had to say. Rubenstein is the man who invented the term ‘genocide’, so I think we can defer to his definition of the word. So it seems absolutely indisputable: under the terms of the UN convention on genocide, Britain was guilty of conducting genocide on the Irish people during the period variously and incorrectly referred to today as the great famine or An Gorta Mor. Now, we are not interested in a Brit-bashing exercise. I can’t imagine that the British of today would in anyway feel guilty (and nor should they) for something committed by an ruling elite that ran both their country and ours a century and a half ago. Britain is historically responsible for a number of attempted genocides, at least one of which was committed on their own soil (the Highland clearances). Indeed, the ‘Great Hunger’ was not the only attempt at genocide on the Irish people. Cromwell’s exploits two centuries earlier spring to mind. I can’t imagine that it would ruin relations with Britain or indeed the British people if we were simply to pay proper tribute to our own dead. In fact, I think many British people might find it illuminating to know what really happened. Certainly, given how the ‘famine’ is taught in schools, I believe it would be illuminating for a lot of Irish people too. I accept the British apology for what Tony Blair’s word is worth. Which is little, in fairness, but I accept it anyway. But that’s not the point. The point is that our own government fails to acknowledge that it was a holocaust, not a famine caused by a lack of available food. The Irish holocaust had little in common with famine or hunger. Should the focus of Jewish holocaust commemorations be on preventing gas poisoning? What would any self-respecting Jewish person say if people expected them to euphemise away the horror their people suffered, or suggested that they get over it and grow up as a people? The Rwandans and Armenians would not accept anyone else trying to diminish the attempted genocides that happened to their peoples. So why do we accept it? The commemoration has nothing to do with the British of today. It’s to do with our own acknowledgment of our own history in a accurate and correct way. When we can do that, then we can really move on as a nation. the National Famine Memorial Day badge as worn by Celtic last season on their shirts on Memorial Day on the day they beat Dundee United to win the Scottish Premiership title.